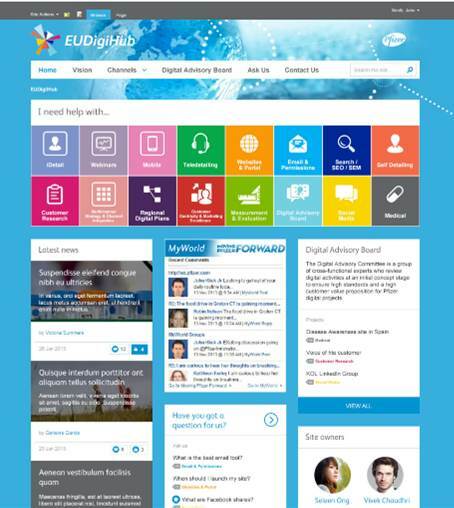 is there a way to make the Sharepoint looks like the picture below (without html coding)? As what I know, most of the Sharepoint with amazing design is powered by paid software such as Shortpoint. I was trying to use free template found on Google but ended up I realized that the template is actually for publishing site not enterprise wiki site. For what environment are you looking for? SharePoint 2013/2016 onPrem or online? Online will be at least a little bit more tricky as there's the access to masterpage/pagelayout restricted. Modern UI is far harder to customize with just HTML and CSS. If we're talking about onPrem environments, you're lucky (with a lot of things to learn). In the case above the left handed navigation is disabled/not shown. The pagelayout is two-rowed with three columns in the second row. Each column got one Web Part Zone. The best way to learn is to copy a pagelayout you want and do some changes in it. Not the answer you're looking for? Browse other questions tagged master-page page-layout custom-masterpage design or ask your own question. Possible to add more than one Page Content area on a publishing page layout?